This is Joel Holdsworth’s attempt to amalgamate all the ideas from all the brainstorming to one consistent idea that makes sense, can be implemented, and seems like it would be nice to use. Comments are welcome. The roots of group tracks show what’s being rendered inside (Ichthyo calls these root tracks "group bars"). This makes sense - I think it might do more harm than good to let the user edit in group roots. The power of manual wiring. I like the way you can wire things together on the timeline. Tracks seem to be generic - all tracks are the same: either a group track or a normal "track". Yet you’ve got some tracks with just filters, some with just automation curves, and some with just clips. The problem here is that it gets confusing to know what to do if we allow the user to mix and match. I think that tracks 1-4 and 5-6 in your diagram need to lumped together in a single complex track. Some of your links seem to go from clips, and some from full tracks. This behaviour needs to be consistent. It’s difficult to know what to suggest. Either links go from clips only - in which case 1hour long effect applied to 100 clips becomes a pain in the arse (maybe you’d use busses in this case). The alternative is only applying constant links between tracks, but this is quite inflexible, and would force you to make lots of meta-clips, anytime you wanted the linkage to change in the middle of the timeline. You’ve got a concept of sub-EDLs and metaclips. We’re definitely going to do that. If a clip is a metaclip, you can open up the nested timeline in another tab on the timeline view. Lots of flexibility by having filter graphs on the input stage of clips, and on the output stage of the timeline. Your scratch bus provokes the idea of busses in general - these are going to be really useful for routing video around. Filter graphs on the input stage: This concept might be better expressed with "compound effects", which would be a filter-graph-in-a-box. These would work much like any effects, and could be reused, rather than forcing the user to rebuild the same graph for 100s of clips which need the same processing. (See Alcarinque’s suggestion for "Node Layouts"). Output stage filter graph: It’s a good idea, but I think we need to re-express it in terms of busses and the track tree. We should be able to give the user the same results, but it reduces the number of distinct "views" that the user has to deal with in the normal workflow. I believe we can find a way of elegantly expressing this concept through the views that we already have. Node Layouts in the media library. This isn’t a page about the ML, but I like your ideas of having stored node layouts in the library. My own name for these is compound effects - but it’s the same idea. Your idea of having collecting a library of these on the website is pretty cool as well. Being able to connect the view port to different plugs in the compositing system - rather like the PFL buttons on a mixing desk. Tabbed timeline for sub-EDLs for having more than one timeline in a project - e.g. metaclips: scne 1, scene 2 etc. I’m not sure, but I think some of these ideas stumble on the problems of reconciling fixed node layouts with the variable nature of a timeline. Either you make connections "per track", in which case there’s not enough flexibility, or "per clip", in which case I think there’s too much if you have 100s of clips. All clips are compound audio/video clips. Groups can be expanded and collapsed. Nudge buttons are shown when the user hovers over the clip. This could be quite a timesaver. 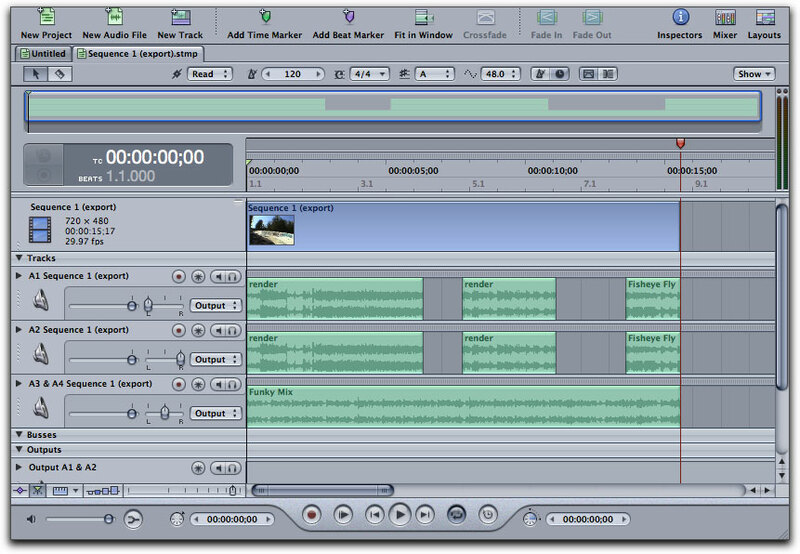 Video filters are shown above the top track in the set of inputs that the effect is applied to. This is useful for displaying filters which have multiple inputs. The highlighting of other attached inputs is cool and useful. Automation curves are show in effects just the same as everything else. Split and heal buttons. Heal would be hard to do well - but still, it’s a great idea. Might require extra metadata to be stored in the clip fragments so they can be recombined. Ichthyo: "you create sort-of “sub-tracks” within each track for each of the contained media types (here video and audio). To me this seems a good idea, as I am myself pushing the Idea (and implementing the necessary infrastructure) of the clips being typically multi-channel. So, rather than having a Audio and Video section, separate Video and audio tracks, and then having to solve the problem how to “link” audio to video, I favour to treat each clip as a compound of related media streams." If a filter has multiple inputs, then how does the user control which track in the tree actually sees the output of the effect? cehteh says: "You showing that effects and tracks are grouped by dashed boxes, which is rather limiting to the layout how you can organize things on screen and how things get wired together". Perhaps it would be better to require all input tracks to an effect to be part of a group track, rather than being able to spaghetti lots of tracks together. The down side of this is it would make it difficult to to use a group twice i.e. have a track that is both an input to an effect, and a normal track - part of the another tree. I’m not sure I understand the (+) feature. Can you explain it more for me? Cehteh: "curves need to be way bigger". Maybe the tracks could be sizable. Cehteh: "You show that some things (audio) tracks can be hidden, for tree like organization this would be just a tree collapse." Mixed Mode Tracks? such a good idea? Extra Headers to display video and audio headings - multi-part headers. Groups are read only tracks, as are the outputs from busses. Every group would actually be a multi-input effect. If no effect is explicitly applied to the track, the default effect could be "overlay N-tracks". If a 1 or 2 or 3 input effect is applied, then only 1 or 2 or 3 child tracks would be allowed. Some effects allow N-inputs. Note that we’d need an effect/effect-stack for every type of media in the group - audio and video. I want to say effects apply to not to clips, or to the whole length of tracks, apply to the periods of a timeline, and in the UI as you change the period of an effect it snaps to clips. However, I think effects have to applied upstream of transitions. This means that effects have to be per-clip. One way to make long effects would be to put the whole track in a group, and apply the effect to the whole group. What happens if you put a 4 channel audio clip in a timeline with 2 channel clips? I guess we display the stereo and 4 channels are equal citizens, then upmix all audio into sound space, then down-mix somewhere downstream. In a compound plugin (stored node layout), I guess some of the parameters would be fixed, but I guess you’d want to present params to the user. The question is how. The most obvious way is to load the params of individual effect nodes with mathematical expressions that relate their params to a list of user-params for the compound node. These user-params would of course be automatable. Mathematical expressions are pretty unfriendly to users though. I wonder if it would be if these node-layouts were simply expressed with AviSynth style script. Hi Joel, I’ll summarize some of my thoughts here. Maybe we should split of this discussion to a separate page? Maybe we should carry over more detailed discussions to the Mailinglist? First of all — I really like your work and the effort to get the GUI reasonable complete but simple. Next, when I choose to take a certain approach for implementing a basic feature in some lower layer, this doesn’t bind the GUI to present it exactly the way it’s implemented. Of course, in many cases the GUI will be reasonable close to the actual underlying implementation, but it’s an independent layer after all. The Session I am building is very flexible, and I take it for guaranteed that the GUI has the freedom of using some of those possibilities always in one certain limited way. And, finally, please don’t take my arguments as general criticism — I am just questioning some of the "usual" approaches at places where I have the feeling or the experience that it would be beneficial, i.e.where re-thinking the solution could lead to a smoother treatment of the problems at hand. Most existing solutions we know or have worked with are more or less derived conceptually from hardware sound mixing consoles and multitrack tape machines. Most noticeable, a mixer strip, (track, bus) means at the same time actual data processing, routing of signals and controlling of parameters. Actual hardware works this way, but in software this is only a metaphor. The hard wiring is rather within our brains. We think it’s most reasonable and simple this way, but actually it creates a bunch of artificial problems. That’s why I am stressing this point all the time. You pointed out that my placement concept may go a bit too far, especially when it attempts to think of sound panning or output routing also as a kind of placement of an object in a configuration space. And, on the other hand, Christian asked "why then not also controlling plugin parameters by placement?". I must admit, both of you have a point. Christians proposal goes even beyond what I proposed. It is completely straight forward when considered structurally, but it is also clearly beyond the meaning of the term/idea/concept "placement". But what, if we re-adjust the concepts and think in terms of 'Advice' ? Thus, a placement would bind an media object into the session/sequence and also attach additional advice? As an example, to apply this re-adjusted Idea to the gain control: When a track group head has an gain/fade control this would just denote an advice to set the gain. It does 'not' mean that signal data has to flow "through" this track/track group, it does 'not' mean the gain is actually applied at this point and it does 'not' mean that any routing decision is tied to this gain. Even signal chains being routed to quite different master busses can receive this advice, given the source clips are placed within the scope of this track group. The only difference needed on the GUI to implement this approach would be an additional setting on the fader, which allows to disable it (no advice at this point), to apply it to audio or video only, or to specify an custom condition (like applying only to media with a certain tag). Obviously, the concept similarly applies to output destination and routing. Actually, by doing this switch-of-concept, most of the problems you and other people noted in the various drafts simply go away. For example the scalability problem which plagues all explicit node editor GUIs. Instead of doing connections manually, just by putting an media object into a given context (sequence, track, track group), it receives any routing advice available in this context. Only those cases really in need of a special wiring would necessitate an additional routing advice directly at the media object ("send to…"). Similar to the example with the fader control, the change needed in the GUI would be an additional setting on the output chooser, allowing to disable it (no advice here), applying it just to audio, video (text, midi or whatever media type we get), or an custom condition or tag. Thus, generally the price to pay would be a more elaborate track head area, which actually is a collection of advice. Besides, of course it causes a lot more work in the “Proc Layer” (which obviously I am willing to take or already try to implement). And, finally, one price to pay is a steeper learning curve for anyone accustomed to the conventional approach. Besides, there are things like "pre/post fader", but I take it that in our model the user just can control the order in which effects are attached. Basically, the mentioned global level could be unified with the track/time range level effects. But especially for Lumiera, with our considerations of using multiple timelines, meta-clips and nested sequences, we’ve probably killed this possible simplification. Because now, an effect applied to the root track in a given sequence indeed is something different than an effect applied to the master output. Because the latter is something global, it’s associated with the timeline you currently render/playback, while the former sticks with the sequence and thus could also go within a meta-clip or sit within a sub-sequence which is used just as one scene in a larger movie. Anyway, I’m doubtful if a global colour correction or a global sound balance mix could be emulated by using a master sequence and effects placed on the root tracks there. Actually, I can’t see what would be better, in terms of handling or workflow. Is this situation so common (probably yes) as to justify building a specific facility? Or would it be enough just to build a specific GUI for this case (which then would necessitate to define a binding between the specific GUI and some otherwise just normal effects in a master sequence)? Actually, what I am proposing is not to have multi-mode tracks, but rather to have type-free tracks. Type is figured out on a per-connection base while building (or on demand). The rationale is, we should prefer to think in media types, not so much in channel numbers etc. Each media type incurs some specific limitations on how it needs to be handled. E.g, even if two audio clips both have two channels doesn’t mean they are compatible. One of them could be binaural audio, meaning, that the other one need to be spatialized with an HRTF prior to mixing (assumed your intention is to create an binaural sound track). Thus, when trying to get the type handling correct based on tracks, we’ll quickly end up with lots of tracks, with the consequence that closely related objects are teared apart in the GUI display, just because you need to put them on different tracks based on their type or some other specific handling. That’s why I am going through the hassle of creating a real type system, so we can stop (ab)using the tracks as "poor man’s type system"
Now, what are the foreseeable UI problems we create with such an approach? I think, all of those problems are solvable, and my feeling is that the benefits of such an approach outweigh the problems. The problems with the preview could be solved by introducing a preview renderer component, instead of doing it hard-wired in code as most applications do. To elaborate on this, what exactly is the benefit of showing 8 microscopically small waveforms for an 7.1 sound track? It would be far better to use a preview renderer, which could visualize a sum waveform, an sound energy average, maximum or even an spectral display. Similarly, a video preview renderer could either produce a strip of images taken from the footage, or just a single image (pivot image), or a colouring derived from motion detection etc. This way, all clip displays could be made to fit the same space in the GUI. Regarding transitions, the Steam-Layer (with the use of the type information) has to find out if an transition is applicable to a given pair of clips. If it is not, it will be flagged as error. Besides, we need an editor for tweaking the transition curve. Now we could consider differentiating this transition curve for several media kinds contained the same clip (audio crossfade goes differently than the video crossfade). But I think, this isn’t worth the hassle, as the user is always free to split off the sound channels into a separate clip and put it on a neighbouring track (and by using a relative placement, the link between both could be kept intact). Just, only the L-cut is such an common editing technique, that it’s worth just supporting it as a special kind of transition. we need an additional advice to specify which channel from the clip should be sent to output. (Implementation-wise, this advice is identical to the advice used to select the output on a per-track base; but we need an UI to set and control it at the clip). Of course, different channels (e.g different sound pick-ups) could be sent to different destinations (mixing subgroup busses). For multicam, this advice would select the angle to be used. When a clip contains multiple media streams, we build an pipe for every stream actually sent to some output. Now the question is, what happens when attaching an effect (either attaching it directly to the clip, or placing the effect on a track/trackgroup in a timerange touching this clip). Basically, Steam-Layer will be able to determine if an effect is applicable at all. It won’t try to wire in an sound effect into a video pipe. It won’t wire an stereo reverb into a mono sound pipe. Thus, I would propose a pragmatic approach to this problem: Let the effect apply to those processing pipes he is applicable and ignore the others. Plus having the ability to limit by an additional advice with an condition or tag (a possibility which I take for granted anyway). We could go for a much more elaborate solution, like being able to expand the clip and then specify explicitly which effect to attach where. But I think, as we have real nested sequences which appear as meta-clips when used, limiting the effects to just apply to "all applicable" is not actually a problem. Again, in the rare cases where more is needed, the user is free to split off a channel as a separate clip.